Changing careers can be a scary proposition, but for Art Docent Mark Vantress, it was strategic transition that’s been a long time coming. This summer denoted the official beginning to life as a full-time professional artist for Mark, who previously worked as a sales and marketing executive. 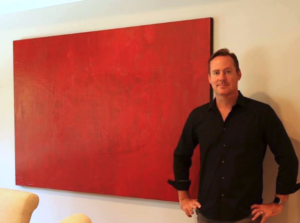 He’s now part of our vibrant art community, and his paintings have sold at private exhibitions in Mountain View and Los Gatos, the Fillmore Jazz Festival in San Francisco, and through multiple private commissions. Mark became a docent last year because he believes in our organization’s mission to bring art into children’s lives. He’s not just generous with his time, either. Mark donates proceeds from sales at various fundraising events, and the Art Docents was one of the fortunate organizations to receive money in 2016. His hope is that kids will see art not only as something beautiful to be appreciated, but as a real vocation. As a student at the University of California San Diego, Mark pursued a psychology degree despite having a profound passion for art, just so he’d have something “to fall back on.” It’s a practical strategy that often sidelines prospective artists for years, if not decades. This is why Vantress is so encouraged by the Art Docent’s Guest Artist program, which he’s heading up this year. “It’s almost like career day,” he says of the Guest Artist event that brings working artists into the Los Gatos schools for demonstrations. “When I was growing up, that wasn’t really shown to be an option.” Vantress sees art not only as a viable career choice for young people, but as a way to bring balance to our culture and society. The image of the starving artist is just that, an image, he says, not a forgone conclusion. We need to communicate that art is also a business, and it can be just as profitable and life-sustaining as it is soulful and inspiring. Why did you choose to volunteer with the Art Docents? We were new to the community and this was a great way to meet people and to volunteer. Also, as I prepared to transition to a full-time artist, I wanted to take actions that were consistent with being an artist, and the Art Docents fills that need on a variety of levels. In your new life as a professional artist, how are you finding the art community in Los Gatos? It’s been very supportive, which I’m glad about. Other artists have been so generous with their time and energy with me. I am also excited about the quality of exhibits that are going on at NUMU and JCO’s, the rejuvenation of Gallery 24 and the opening of the Whitney Modern. It’s a great time to be an artist in Los Gatos! What artists’ influence you or your work? My work is influenced by artists such as Pablo Picasso, Jackson Pollack, Clyfford Still, Lee Krasner, Joan Mitchell, Mark Rothko, Robert Rauschenberg, John DiPaolo and Charles Eckart. My philosophy is that works of art should have energy that is honest and authentic and created with respect to the principles and techniques of the craft. How can we help support you? I’m always looking for restaurants or even designer showrooms to display my art. I’m also working with an interior designer that uses my paintings in home staging, so there’s opportunity there as well. Some artists don’t like to paint for decoration, but I’m not like that!